A newbie to the D.C area, Walter Grio is already making a name for his spur-of-the-moment idea -- taking pictures to benefit charity. He moved to the District on assignment for his daytime job for Oracle thinking about anything but "Shoot for Change," his current philanthropic endeavor. But six months later, he held his first exhibit in D.C. to benefit the Children's Law Center. I started as a wedding videographer. Somewhere along the way, I fell in love with the technical aspect of taking pictures. I was traveling a lot, so I bought an entry-level Nikon D50 camera to capture where I was. My first stop was Canada, so I took pictures there, and that's how I fell in love with photography. How did "Shoot for Change" come about? I was assigned to work in Stockholm for my job. One night I was with friends at a bar and I started taking pictures of them ... just having fun. A makeup artist walked up to me and asked if I was a photographer and if I could help her shoot for her portfolio. I said yes, but I didn't have any experience doing fashion shoots. So I’m in Stockholm, and she's going to get three Swedish models to do hair and makeup ... "Am I dreaming, or am I in a Candid Camera prank or what?!" So I said of course. We met on a Saturday in downtown Stockholm. Seeing the models and their beautiful hair and makeup with the architecture of Europe, I'm thinking to myself this is pretty awesome. After shooting for 12 hours, I'm sitting in my hotel room thinking, "What's going on here ... this is crazy." A few people saw my photos from that shoot and asked to take their photos and name my price. I Googled my price because I wasn’t exactly sure! I don't know exactly how or why it happened, maybe because I was in Stockholm in a hotel, and everything was being expensed through my company, I said, "If you want to pay me to do something that I love to do, why don’t you donate that money to charity?" They asked which charity and I told them to decide. I wrote out a paragraph about this idea and then somewhere along, the text "Shoot for Change" came about. I Googled it and nothing came up, so I registered the domain and just kind of went from there. You've stirred up quite a buzz since this is your first exhibit in D.C. How have you taken it all in? I'm pretty overwhelmed! At first, it was just a matter of signing up to photograph different events. Now, after this exhibit, it's kind of taken a turn for the better. I'm excited about where ["Shoot for Change"] is going and that people are supportive of the idea. People may be shocked at first, but once they understand it, they're like, cool. So it's exciting. I definitely want to capture the person I'm photographing and who they are. If I'm shooting for a fashion shoot, I want to get to know the model to see if they fit the picture we're trying to shoot. I would say my style would be something people would have to tell me what it is versus me saying what it is. On an emotional level, what can a photograph make you feel? One thing that speaks to me when I see other photographs -- that I try to do as well -- is something that conveys a little bit of slight confusion and maybe a feeling of being lost. For example, the pictures I've taken with the masks -- there is some shock to them. 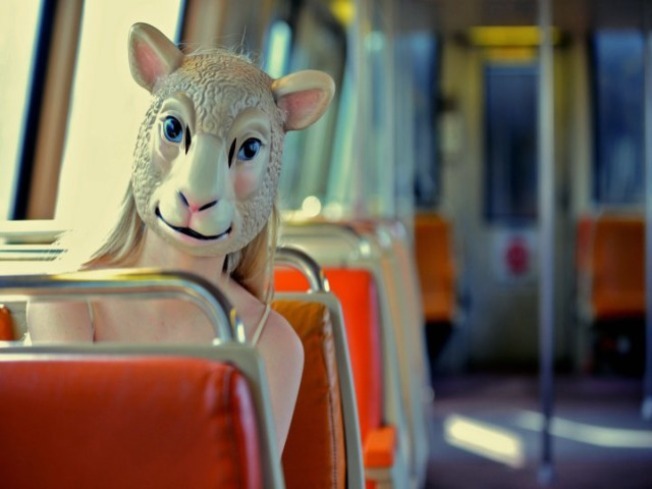 The biggest thing that I like in photos is contradiction, whether that's taking a beautiful model and putting them in a harsh location or taking a girl and shooting her on a Metro with a sheep mask -- it just doesn't really fit, but at the end it really does. Definitely people, whether it's a wedding or a fashion photo shoot with a model. I like to capture people in candid mode, not so much posing -- although that contradicts with fashion. You're involved in fashion photography; something or someone must inspire your personal style. There are many fashion photographers here in D.C. whose work I like. Definitely some designers, Elizabeth St. John in particular. I saw her work at DC Fashion Week in January ... all the dresses that I've used for my shoots are designed by her. The concept of using zebra masks was inspired by her dresses. When I saw her dresses, I wanted to shoot them in a different way. I imagined white wedding dress in the woods with a girl wearing a mask. I e-mailed Elizabeth St. John about this crazy idea and she loved it. What's been your most memorable assignment to date? I was on Facebook looking through photos from this professional fashion photographer. I noticed the shoot was styled by a man named Michael Dye. I e-mailed him and it turned out that he was a London-based stylist for "Vanity Fair Italia" and "Vogue Gioiello." I asked if it was possible to do a photo shoot with him, my hope was that the photos would benefit an organization I was raising money for in Seattle. He replied yes. At the time I was in Nuremberg, Germany, and my friend, Ann, was going to visit from the U.S. the same weekend of the photo shoot. We planned to visit Paris that same weekend when she got in town and since Michael Dye was in London, I dropped off this American girl in Paris for one night! I then took the Eurostar train to London, where I met Michael Dye and his three assistants. They did all the set up; designer dresses, jewelry and just a hundred thousand dollars' worth of stuff laid out on my coffee table of my hotel room. I was staying in a fancy hotel in London, and of all the places to shoot, he was interested in shooting in a corner of the room because of the wall's color. That led me to think more of colors, especially when it comes to fashion. He worked fast -- it was like, shoot photo. Next. Done. Then I took the train back to Paris to get Ann and I was like,"I'm sorry, but I just got the most amazing pictures." You've traveled a lot -- any particular place you like photographing most? I would say Venice, Italy. Just the place itself -- I feel you can't take one bad picture in Venice. You could frame it not perfectly and it would still come out perfect. Who or what would you like to photograph that you haven't already? The Obamas. I think they would be great for obvious reasons ... it would be awesome to have that opportunity. What kind of impression do you hope to leave upon others who see your photographs? This ties in with "Shoot for Change," the whole concept of possibilities. When people look at my pictures, I want them to leave thinking anything is possible. Whether it's shooting someone on the Metro or a little girl in Paris. It's knowing what "Shoot for Change" is -- that anything is possible.